At this famous 1915-16 hotel where among other luminaries JFK has stayed, and Bob Hope proposed marriage in 1934, there are said to be two haunted floors. Floors 22 and 23, both unused, are visited by strange sounds, cold wind gusts, and ghosts that hide and watch folks, giving them an eerie feeling. It is said that a murder once was committed on these floors. 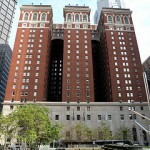 There are no guest rooms on the 20th floor of the William Penn. Nice try. It is said that the murder was of a coed during a wild party, and years ago the floor or floors served as a dormitory for a local college. This is second hand info and I have never been able to actually confirm this information with any actual documentation. I used to work at the Westin William Penn (Club Level) and didn’t learn of the haunting until after I left my employ there. I am wondering which hotel my great uncle, Raymond Whitmer fell out of a window at. Our family was told he was washing a window, and fell. But others told us that he fell from a window that was a room of a wife of an employee. That my uncle was murdered by her husband. Have you heard of this? I stayed here for two nights in this hotel in 2012. The first night I had a dream that an old lady and man came into the room. They were carrying luggage. The old lady dropped her luggage when she realized I was in “her bed”. She yelled at me that the bed was hers because she was murdered there. She ran towards me and hit me over the head with a book. I woke up. Also, I don’t remember what floor I was on. I had no idea at that time about this hotels history. Bogus comments. I stayed there in 2014 and recently in 2015, it’s very historic and beautiful inside. You just have a feeling when you walk in by the decor and service that it has serviced some of the more elite people of many generations. It’s old school Hollywood glamorous meets modern day luxury. It also houses a nice social scene in the main lobby as it services many business class guests. I enjoyed my stay and look forward to visit there again. I just stayed in a room on the 12th floor and heard a female voice as I walked out the door one morning. Then that evening as after I went to bed I heard a female voice laugh in the corner. I had no traveling companion. I heard about the haunted after I mention the morning after I heard the laugh. I’ve been staying occasionally at the Omni William Penn for at least 10 years for business and until last night have never had the slightest unusual experience or thought. I stayed on the 8th floor near the west elevator bank and was awaken at 3:30 am by a very bright light in my eyes. There was a male presence directly over me looking down at me (directly in my face) and he appeared to be startled when I awoke and recognized him watching me and he quickly moved to the wall by the head of the bed…the movement was much more quickly than I could imagine a human could move, it was almost a flying motion to the stationary location. I was obviously in awe of what I just experienced and stared in the direction of where he moved and then the presence seemed to vanish over time as I stared at the location that it had moved to. That was it, but it was definitely real, there was a presence in the room watching me as I slept. I stayed at the Omni William Penn Hotel. It was my first paranormal expirence that I have ever had. I seem to be pretty sensitive to the Paranormal. Anyway I was staying with my family in a hotel room, on I forget what floor it was, but all I can remember of the hotel room was that it had no view, all you could see was a brick wall. At first the hotel room seemed like a normal room, but after a few hours that atmosphere changed, I could feel a sense of dread, a sense of dread, and the temperature of the room plummeted. I remember getting ready for bed. I went to the bathroom to brush my teeth when I looked up and I saw the face of a woman in the mirror. She was pale white, had dark bags under her eyes, and some blood ran down her face. I ran out of the bathroom so fast. I told my Parents, but of course they didn’t believe me. Might have been the same one attacking me on the 10th floor. My uncle fell to his death from a window at a hotel in downtown Pgh, back in the 30’s. I am trying to find out which one. Did you ever hear of a window washer that fell? Rumor in my family is he was murdered by the husband of the wife who was in the room he fell from. A search of PGH newpapers found there were a few window washer deaths. One in 1946 James Maloney and one in 1983 Robert Ferguson. Robert titus 1955 fell to his death. In 1943 Lee Martin fell and died. Stayed here this week for a conference. Nice place. I did find it odd that when I sat down for breakfast with a group of people I had never met before, 5 out of 6 people at the table said they had major issues sleeping the night before, myself included. Could just be with all the warm weather that quickly moved into the area, but I don’t recall a night’s sleep where there was a particular hour that passed where I woke up literally every 3 to 4 minutes. I can’t recall anytime in the last 10 years where I’ve experienced that. Again, could be nothing and I wouldn’t have thought anything more of it if I didn’t hear several other people all voice the same complaints at breakfast. For what it’s worth, I was also on the 8th floor. Didnt notice anything out of the ordinary aside from that! Stayed on the 14th floor and Sunday morning (5:45) I woke up to a door slamming and a women desperately yelling for help ….. I listened thinking I dreamt it and heard her cry out for help again…I shook my husband awake and told him there is a women in trouble I the hall we need to help …. He gets up (bless his groggy heart) and goes to check and there is NOTHING in the hall. Thinking back the whole weekend I never heard people in the hall (I wish modern hotels were that sound proof) but that mornings heard her clear as bell. Can you stay on the 22nd and 23rd floors? I was a housekeeper there for just the month of June 2016. One afternoon I was cleaning a room, not sure what floor, but as I was finishing up, I put three magazines on the circular end table, as I turned around to start vacuuming, one magazine flew off the table, not thinking much about it, went back and placed it back, and checked to see if the table was unstable or something, turned around and it flew off the table again. Ok…… chills went up and down my spine, I left it on the floor and vacuum my way out, ran back in placed it back, and took flight out of that room. Ever since that day, I’ve been feeling strange vibes up and down the hallways. Creeeepy!!!! !, but it’s a beautiful hotel and loved working there. I normally stay at the Wm Penn when I’m in Pittsburgh for AnthroCon and have never experienced anything out of the ordinary. I do know there are ghost stories connected to the hotel. Maybe the spooks got weirded out by all the Furries? piano. Around the corner, I walked down a long hallway to doors that looked like an employee door. When I opened the door it took me to a whole other corridor of the hotel. It looked like I went back in time with a bunch of empty rooms without doors and dim lighting. I turned left and walked all the way to the end of the hallway where I saw another door that looked like it led to a staircase. The whole while, I felt like someone was watching me with every passing room. When I got to the door I opened it to a staircase that led up 7 more flights of stairs. I started climbing the stairs with a very uneasy feeling. I have had experiences with the paranormal but this one felt the most intense. As I came up to the 24th floor, I felt like something was bearing it’s weight against me. 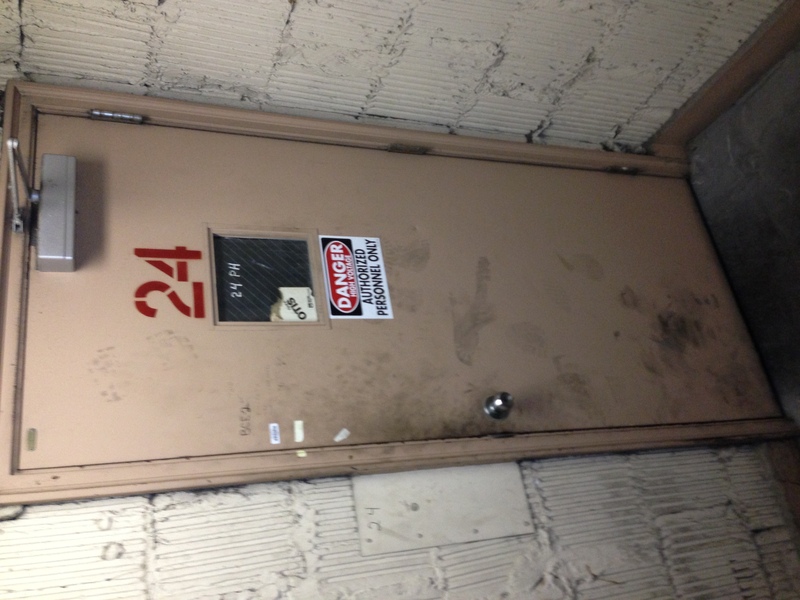 As I felt that feeling, I took a picture of the 24th floor door. Immediately after I felt something brush my ear and I heard it say clear as day, “get out.” Whispered in my ear. That’s the point where I proceeded to jump down each flight of stairs as fast as I could to get to the 17th floor door and out of that corridor, down the elevator and back to my room. At this point it was about 4:32 am where I entered my room and, turned on all the lights, jumped in my bed and called the girl I was dating at the time. It was the realest most uncomfortable paranormal experience I’ve ever experienced. This story is 100% true. Ever since then, I’ve tried to always go back and visit the Omni William Penn hotel every time I come through Pittsburg. I have a new respect for the hotel because of the experience I had. But I definitely steer clear of the hidden corridor everytime if visit. I’ll post a picture of the door I took a picture of. So I went in there tonight infact during a convention. And being very spiritually aware I started having an extremely bad time as soon as I went in there. Something did not want me and a friend of mine in there. Nothing to physically harm us, but definitely throwing negative energy our way. Something is definitely there and doesn’t want other people around. I was there during AC 2010 and could feel the place as I entered. I went there for a conference. Beautiful building especially for those who enjoy older architectural details. I stayed on the 10th floor during my stay, I was excited to stay there, definitely had the old Hollywood glamour look. Many people who attend the annual conference I was at refuse to stay there anymore from experiences they’ve had. A definite must see place and everyone who works there are very friendly and accommodating but it spooked me for sure!